Though California is a massive state and the Los Angeles area is a juggernaut of a metropolitan area, you are still able to but “safe and sane” fireworks for the 4th of July. Even though residents are allowed to buy certain type of fireworks freely, there are still plenty of limitations on the matter. Retailers are only allowed to sell for a very short period of time which is June 28th through July 6th. Additionally, local ordinances can override statewide policies, so using fireworks of any sort in your neighborhood could easily be breaking the laws. Additionally, California specifically prohibits what they call “dangerous fireworks” so you can’t buy or use certain types of fireworks without special permitting. These fireworks include things like aerial shells, bottle rockets, and roman candles; pretty much anything that shoots up in the air and goes “boom”. The exception to this rule is if you are a licensed pyro technician; then it’s okay to buy the larger items for your amateur or professional show provided you follow all the legal procedures outlined in your training. To clarify, “safe and sane” fireworks are the tamest types of fireworks that you used while growing up. This includes things like sparklers, black snakes, smoke balls, and fountains. You can buy sparklers in California at most gas stations, grocery stores, and other places that sell general merchandise, but you’ll need to go to an actual fireworks store if you want to get larger “safe and sane” fireworks like fountains. These stores usually pop up in parking lots and abandoned fields for a week or two only, but they usually have the best selection and the best prices if you want to shop locally. Lastly, as with almost every other state, California prohibits the sale of fireworks to anyone under the age of 18. This one shouldn’t come as a surprise; unless of course you live in one of the states that have a different age limit. This law is statewide so areas like Los Angeles can’t change the legal purchasing age of things like sparklers on their own. However, even if they could, I highly doubt they would want kids using fireworks unsupervised. Overall, the California fireworks laws are pretty well in accordance with other major metro areas throughout the country. Sparklers and other small fireworks are typically legal to use while other, larger, fireworks are made off limits. 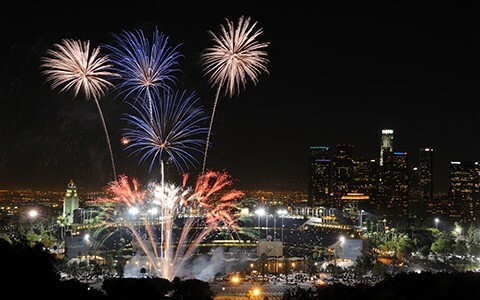 It’s nice to know that Los Angeles is still able to celebrate using the appropriate fireworks and that there is common sense laws in place to protect the safety of the citizens and their neighborhoods.